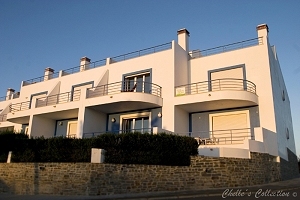 This house is a huge, spacious, luxuriously equipped holiday home for families and surfers. It is located on top of the cliff of the Arrifana beach. It offers beautiful views from the balconies in every room on three different levels and two different sides. Sleeps 8 people. 3 minutes walk to the beach. 2 bedrooms, kitchen, living area, bathroom, basement living/sleeping (sleeping for 4 persons, it has 2 bunkbeds), balconies in most of the roomsand on three different levels. Fully equipped kitchen. Washing machine. Satelite TV, DVD player (big 32'' plasma TV). Internet.